Rudy Jahchan and Casey McKinnon went to high school together, but as far as they can remember they never exchanged words. He was a nerd, and she was an intimidating alternative chick. They met multiple times over the years at events held by mutual friends and eventually bonded over their love of brownies, Dune, and Evil Dead: The Musical. They started dating in 2005 and went on to accomplish great things together by combining his knowledge of writing and technology, and her newfound abilities as an actress and producer, to create multiple web series. In the years to come, they won many awards and were featured in a number of international publications including Rolling Stone magazine, the Hollywood Reporter, the BBC, and more. In the wake of these successes, the couple moved to Los Angeles to further pursue their dreams. On Christmas 2011, Rudy and Casey awoke to a tree full of presents. When Casey opened her gifts from Rudy, there was a running theme; her favorite video game series Portal. He got her Portal coasters, Portal cookie cutters, a Portal scarf... it was WEIRD. Little did she know, there was another gift that Rudy was planning to give her, but he hadn't finished it in time. 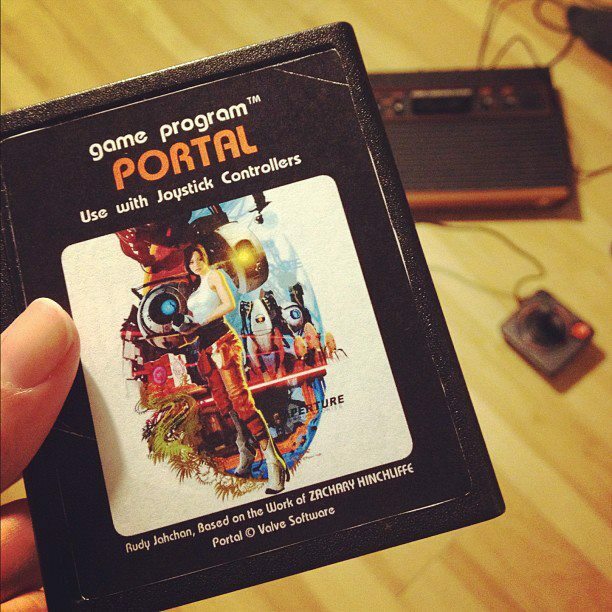 The custom made Atari 2600 version of Portal by Rudy Jahchan. A couple of months later, the two went out for Valentine's Day. Due to traffic, they didn't make their dinner reservation and went straight to their movie on an empty stomach. After a late dinner at the Cheesecake Factory, they headed home disappointed and sat down on the couch to watch a little Star Trek: Deep Space Nine. Rudy had a gift to give Casey, but he was waiting for her to go to the bathroom, so he could surprise her with it when she came out. And waited he did. Sometime around 12:30am, she finally got up. While she was away, the sly devil surprised her with a gift; an Atari cartridge he personally coded based on Portal. She was stunned! After Rudy insisted she play it immediately and started recording her on video, she had a sneaking suspicion that this could be it! Why else would he go through so much trouble programming a video game for her?! For this reason, she was very very quiet when playing the game... she was busy hoping and praying to Zod that she was right. And she was. And she said yes more than once.